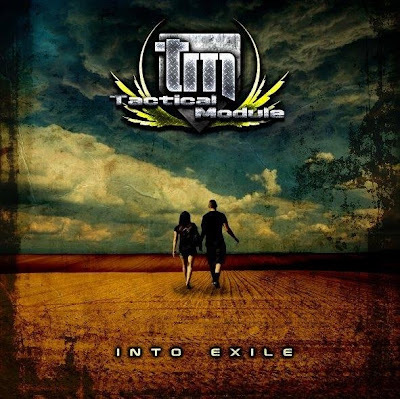 Tactical Module may be a relatively new name in the industrial scene, but that hasn't meant they've taken their time in crafting a back catalogue. Already with a handful of EP's to his name, Michael Davies has pushed his ideas from the word go and as a result, each outing has seen the TM sound grow stronger and stronger. The band's début, 'World Through My Sight' was a metal infused take on industrial that showed a lot of promise from the act, but by the time of the band's free EP 'Resurrection' the formula was definitely becoming solidified. Fast-forward only a few months and the band's sophomore outing 'Into Exile' shows a big leap forward in quality and execution. The album blends the metal elements with a a more well-rounded harsh ebm style and incorporates ambient and even dubstep elements throughout that will appeal to fans of the likes of Cubanate, System:FX and Be My Enemy. Tracks like 'Outer City Limits', 'Cypher 2.0', 'Downpour' and 'Hellfire' carry on the more overtly metal guitars, while the likes of 'Awaken', 'Into Exile', and 'Breathless' are purer dance floor-orientated offerings. The end result is a nice balance between club-friendly songs and ones that are begging to be played live. The bonus remixes extend the life of the tracks nicely, but it's the contribution from Defeat that shows just how much more dance potential is locked up in the tracks. While the Ruinizer remix of 'Awaken' unleashes the sheer brutality locked away within. For the most part the album is nicely mixed and sounds pretty well-balanced with the synths and guitars avoiding that trap of getting too-entangled with each other. The only downside is in the vocals which, despite their refreshingly punky style, sometimes sound a little out-of-keeping with the rest of the mix, and could do with a little more variation in the effects used on them. At the end of the day this is a very solid release that shows a lot of growth in the right kind of directions for Davies. It's not quite there yet, but 'Into Exile' shows that Tactical Module is living up to its potential, and that Davies is aiming high and continuing to constantly evolve his musical approach. This should definitely have people taking notice.